An indispensable kit. Helps treat pain and swelling, cuts and scrapes, burns. Supplies are easy to find in patent-pending, clear-pocket pages. Recommend by Health Care Professionals. 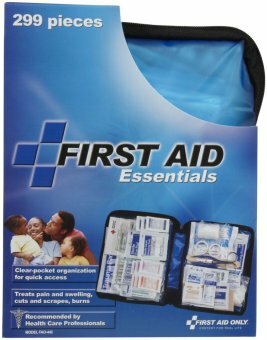 Reviewed and approved by a Medical Advisory Board exclusively for First Aid Only. 75 - Adhesive plastic bandages, 3/4" x 3"
20 - Fabric bandages, 3/4" x 3"
30 - Adhesive plastic bandages, 1" x 3"
10 - Fabric bandages, 1" x 3"
2 - Elbow & knee plastic bandages, 2" x 4"
50 - Junior plastic bandages, 3/8" x 1-1/2"
1 - Patch plastic bandage, 1 1/2" x 1-1/2"
1 - Instant cold compress, 4" x 5"
1 - Emergency blanket, 38" x 60"
2 - Finger splints, 6" x 11/16"
2 - First aid tape rolls, 1/2" x 5 yd. 4 - Gauze dressing pads, 3" x 3"
2 - Gauze dressing pads, 4" x 4"
1 - Conforming gauze roll bandage, 2"
10 - Cotton-tipped applicators, 3"